​Not only do we here at the Elbarr provide in-house entertainments and activities but the local area and surrounding countryside offer not only outstanding views but attractions for all the family, all within easy reach of the premises. 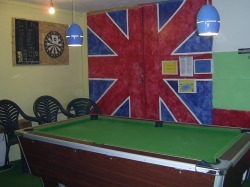 This is the games room with pool table and darts. Every Tuesday we hold a pool competition. Come and give it a go with us!